I love making these small chocolate tartlets, and have found many dessert uses for the cream cheese dough. I use it for mini tartlets, and for a variety of full-sized tarts and pies; I use an amended version for rugelach. 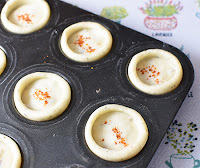 But I never crossed the line and made them with a savory filling... until recently. I was looking for an appetizer to pair with a bottle of Whispering Angel Rosé. 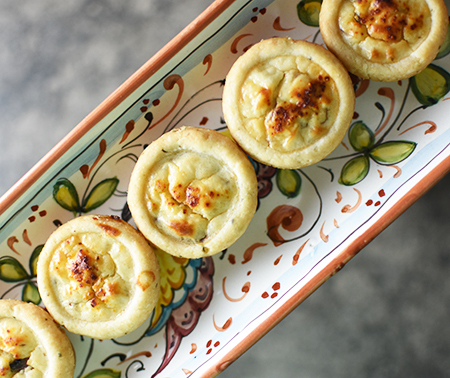 Knowing the wine pairs well with goat cheese, I thought I should create some little goat-cheese tartlets. You can read about this pairing on the Provence WineZine. Using the proportions of my chocolate tart recipe, I started on the filling. I got fresh chèvre at the farmers market from Alethea at Fiore di Capra. Wow, I wish you all could get her cheeses! She is quite an artist. I enriched her chèvre with some mushrooms, shallot, Aleppo pepper, brandy, and an egg. These tarts are best served warm from the oven; I tried them at room temperature, and they were lacking. Following the recipe, I give instructions on how to make them in advance so they can be reheated and served right out of the oven. 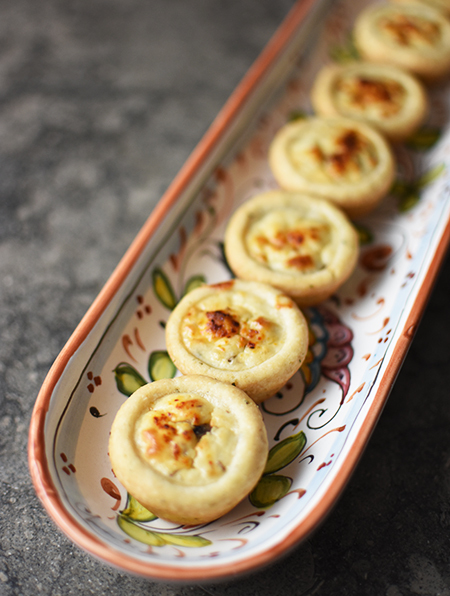 Now, I need to see what other recipes I can come up with for these savory tart shells! 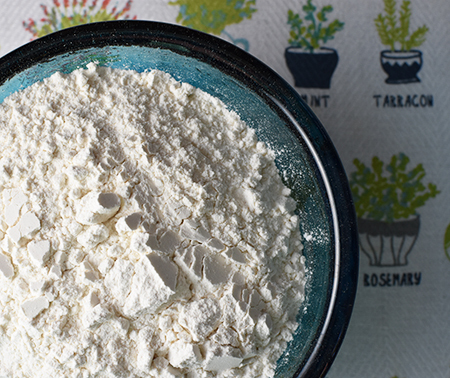 To make the dough, place the flour, salt, and rosemary in the bowl of a food processor and pulse several times. Add the butter and cream cheese and process until the ingredients form a ball of dough. Divide the dough into 24 even pieces. 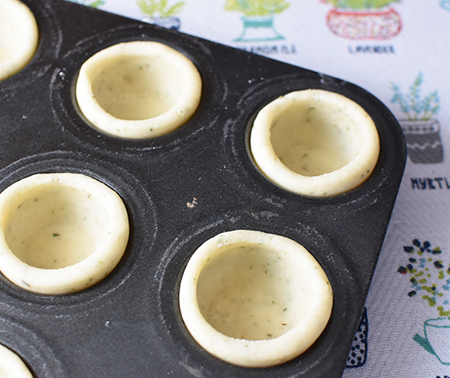 Roll each piece into a ball, flatten them slightly, then place them in the cups of a mini muffin tin. Shape each piece into a mini tart shell, then place the pan in the refrigerator while you make the filling. 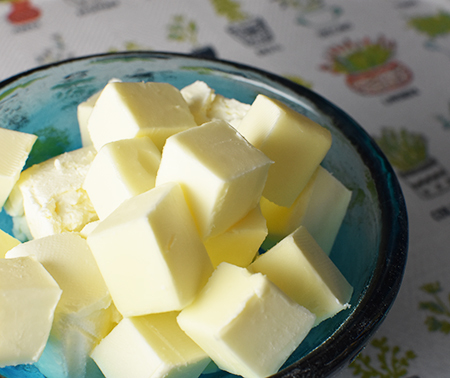 Melt butter over medium heat in a small saucepan. Add the mushrooms, shallots, and Aleppo pepper, and sauté until the mushrooms have released their liquid and the shallots are softened - about 3-5 minutes. Add the milk, mix well, then add the chèvre. Stir the mixture over medium heat until the cheese has melted. 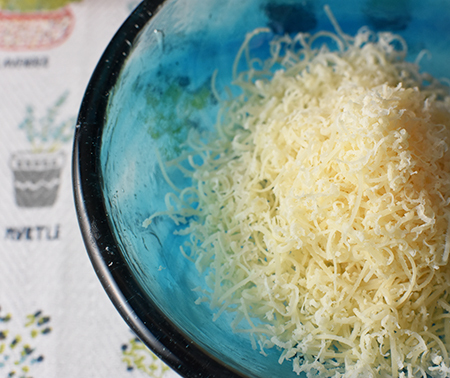 Remove from the heat and add the egg and Parmigiano-Reggiano. Stir quickly to blend thoroughly. Using a teaspoon, fill each tart shell 3/4 full (the filling will expand during baking). 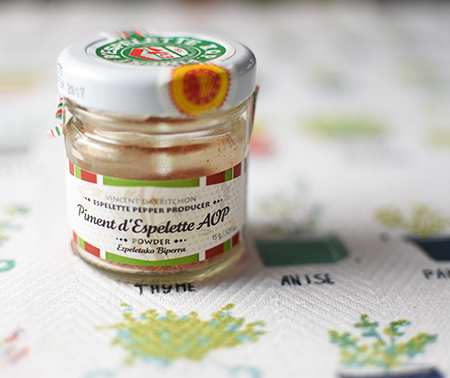 Sprinkle the top of each tart with some piment d’Esplette or paprika. Bake for 28 minutes. Serve warm. Note: to make these in advance, I recommend baking them for 22 minutes, then keeping them refrigerated. About 1/2 hour prior to serving, preheat the oven to 350°F and then bake them for 10-15 minutes, or until golden. Small savory bites like this are so delicious. Who needs dinner after eating them. It is so true, Gerlinde, we often will eat lots of nibbles rather than a full meal! I completely agree! Maybe an array of several different mini tarts! I'm loving your rosemary additions to tart bases, David. Such a fab way to inject extra flavour. These tartlets are gorgeous! The last time I made these, John, are used a lot of black pepper in the crust with a tiny bit of finely grated Parmigiano-Reggiano! Fantastic! Perfect twist. Love your creative ways ! Since warm days are knocking we shall gather outside a lot and this is one of those little beautiful surprises to be found in my basket :-)Thank you so much ! 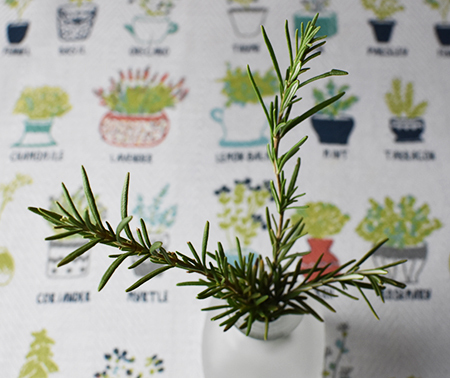 We love a good «apericeno» in our garden, and these will be front and center this year! That is what I like about you Frank... even though you prefer the savory, you will take one for the team and have the sweet, too! The creativity and expansive knowledge you show here is amazing! Wow. I love these! And I think I can make them! I have no doubt, Mimi!! I have such a weakness for goats cheese, so I could eat a whole plate of these in one sitting. Luckily, Emma, we had company - otherwise we would probably have eaten them all ourselves, too! These are just so pretty David, it almost seems a shame to eat them! 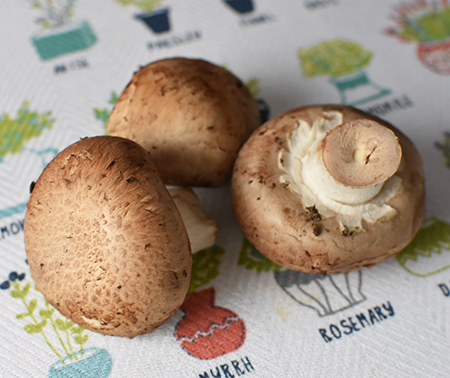 I love the combination of mushroom and goat's cheese so I know I'd really enjoy these. I am not sure I had ever used this combination before, Caroline, but I will be doing so again in the future! Glad you enjoyed the post! Oh boy, I'm always on the lookout for new pastry recipes. 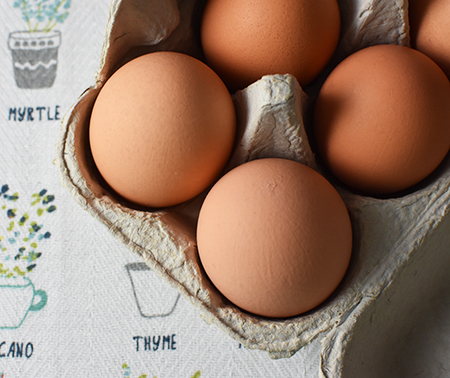 I do have a mini-tart pan on hand, so this recipe would work well with it. I like the neat way you finished off the tops of each pastry- looks sort of like you rolled the top edges of each tart over a little to give a clean edge. Way to go! Fran - I wish I had been that clever. Between the consistency of the dough and the tamper I use, I get pretty perfect crusts each time! If you go back to the chocolate tart post you can see the tool I use! I really love the pastry you made with rosemary and cream cheese, David. I can think of many occasions when I'd serve these beautiful, little tartlets. They look heavenly! The dough is very forgiving and so easy to make! Think of all the possibilities, Marcelle! I have about 3 ounces of cream cheese in the fridge--these little gems sound like a great use for that cream cheese! What a beautiful appetizer David! And one can never have too many recipes for an easy pie dough! I am sure you and I are not alone in this feeling, Inger! David, these are beautiful. And they would be the only savory tartlets I could eat at a party. Because, as you know too well, everyone uses store-bought and they are full of garlic! Even if I was not allergic to garlic, I would think they were *over*-garlicked!